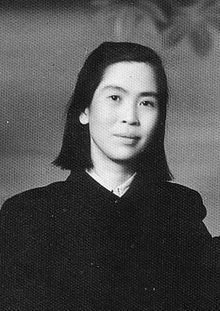 He Zizhen (Chinese: 贺子珍; Wade–Giles: Ho Tzu-chen; September 20, 1910 – April 19, 1984) was the third wife of Chairman Mao Zedong from May 1930 to 1937. He Zizhen was born in Yunshan (云山, now Yongxin County), Jiangxi, during the Qing dynasty and joined the Communist Youth League of China in 1925. She graduated from the Yongxin Girls' School and joined the Communist Party of China in 1926. He Zizhen was introduced to Mao Zedong at Jinggangshan by Yuan Wencai, a classmate of her elder brother, in the spring of 1928. An expert in guerrilla warfare and a capable fighter, He Zizhen was also an excellent shooter who earned the nickname of "Two-Gunned Girl General." When they married, Mao had not divorced his second wife Yang Kaihui, whom he had wed in 1920. Yang was arrested and executed in 1930. He Zizhen had three daughters and three sons with Mao Zedong, but except for their daughter, Li Min, all of them either died young or were separated from the family. Their eldest daughter, who was left to a local family in Fujian, was found and recognized by He Zizhen's brother in 1973, but never had the chance to meet Mao or He. Two English researchers who retraced the entire Long March in 2002–2003 located a woman whom they believe might be a missing child left in the care of others by Mao and He in 1935. In 1937, she traveled to the Soviet Union to treat a wound sustained earlier in battle, later attending the Moscow East University. While He Zizhen was in Russia, Mao met and married his fourth wife, Jiang Qing. Upon her return to China in 1947, she found she could not hope to fulfill any sort of political role in Beijing. She later became the chair of Zhejiang Province Women's Union. In 1984, He Zizhen died alone in Shanghai. In 2007, a memorial hall was opened in Yongxin for He Zizhen with her daughter, Li Min, present as a guest. ^ "1930年杨开慧遇害时毛泽东在干什么". V.ifeng.com. Retrieved November 12, 2014. ^ "听闻杨开慧就义毛泽东难以入眠_理论频道_新华网". News.xinhuanet.com. Archived from the original on November 7, 2015. Retrieved November 12, 2014. ^ Zhi-Sui, Li (June 22, 2011). The Private Life of Chairman Mao. Random House Publishing Group. ISBN 9780307791399. ^ "毛澤東尋訪長女 福建農婦是"紅色公主"". Big5.xinhuanet.com. Archived from the original on November 12, 2014. Retrieved November 12, 2014. ^ King, Dean (2010). Unbound: A True Story of War, Love, and Survival. Little, Brown and Company. pp. 432 pages. ISBN 978-0-316-16708-6. Chang, Jung; Halliday, Jon (2005). Mao: The Unknown Story. London: Jonathan Cape. ISBN 978-0-224-07126-0. Feigon, Lee (2002). Mao: A Reinterpretation. Chicago: Ivan R. Dee. ISBN 978-1-56663-458-8. Hollingworth, Clare (1985). Mao and the Men Against Him. London: Jonathan Cape. ISBN 978-0224017602. Pantsov, Alexander V.; Levine, Steven I. (2012). Mao: The Real Story. New York and London: Simon & Schuster. ISBN 978-1-4516-5447-9. Terrill, Ross (1980). Mao: A Biography. New York City: Simon and Schuster. ISBN 978-0-06-014243-8. Schram, Stuart (1966). Mao Tse-Tung. London: Simon & Schuster. ISBN 978-0-14-020840-5. Snow, Edgar (1961) . Red Star Over China. New York City. This page was last edited on 2 November 2018, at 10:31 (UTC).